Sheer magic! Falling 2,030 feet down the eastern side of El Capitan, Horsetail Fall is a seasonal waterfall that flows as two side-by-side streams during the winter and spring months. The reason it’s famous? For a few weeks every February, if conditions are perfect, the sun sets in just the right position to light up the falls, making them appear as if they are on fire. Sometimes called the “firefall” do not mistake this natural phenomenon for the historic, man-made firefall off Glacier Point. 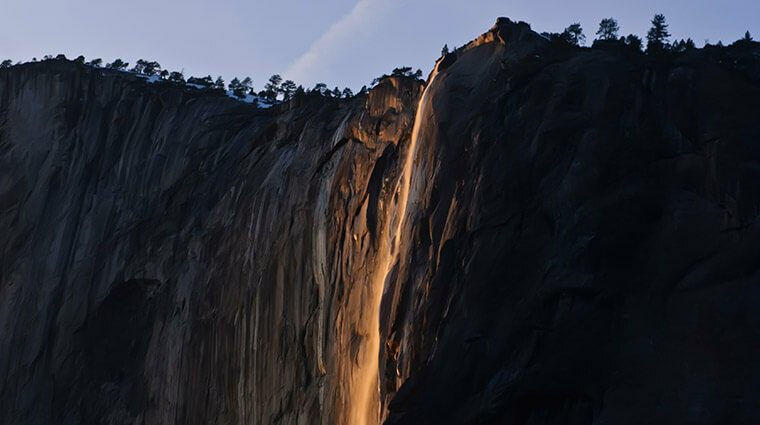 Watch this Yosemite Nature Notes, “Horsetail Fall” to learn more about the “firefall” phenomena.